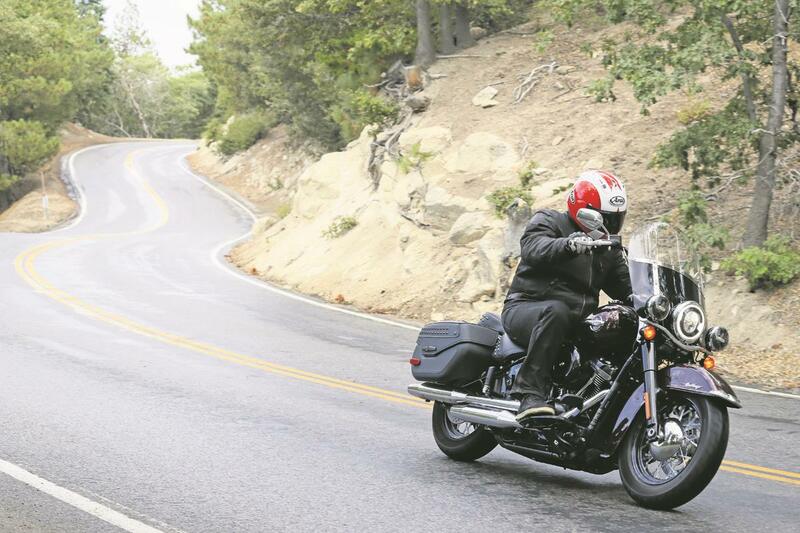 Move over Street Glide and Road King, the ‘40s-style ‘bagger’ is now here. Improved dynamics, performance and detailing are added to great comfort and a fresh new style. 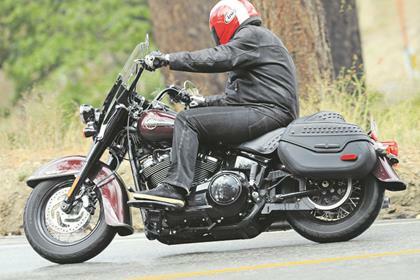 The focus of the new Softail family is the all-new Softail frame (so-called as it hides the rear suspension giving a classic hardtail ‘look’) which now uses an inclined single shock, Yamaha LC style, in place of dual shorter units previously mounted beneath the transmission. The new tubular steel double cradle is also claimed to be substantially lighter, stiffer and comprise far fewer components. Three different head angles, two shock lengths and two widths of swing arm are also employed in a modular approach to create the eight different models. In Heritage form the ride itself is comfortable and the handling is surprisingly light and nimble. As with three other members of Harley’s new Softail family, the new Heritage Classic now uses the four-valve, partially oil-cooled ‘Milwaukee Eight’ 107ci V-twin, as introduced in its 2017 touring range, with the option also of the 114ci version. 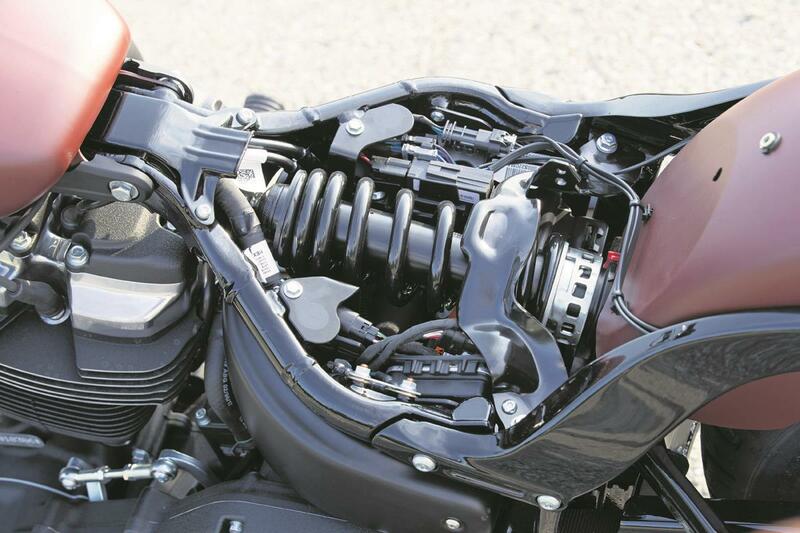 Both are modified for Softail use via a new oil cooler subtly positioned between the downtubes and, as they’re rigidly mounted in the new Softail frames (in the tourers they’re rubber mounted) come with two, not one, balancer shafts. Along with the new frame, uprated engine and cycle parts and new equipment such as lights and clocks, the build quality of the new Heritage Classic, and indeed all the 2018 Softail family, has been noticeably improved.This powertrainis based on that of the proven ‘Project Rushmore’ touring family and quality seemingly raised throughout, we’ve little cause for concern with regards to reliability. Harley ownership never comes cheap. 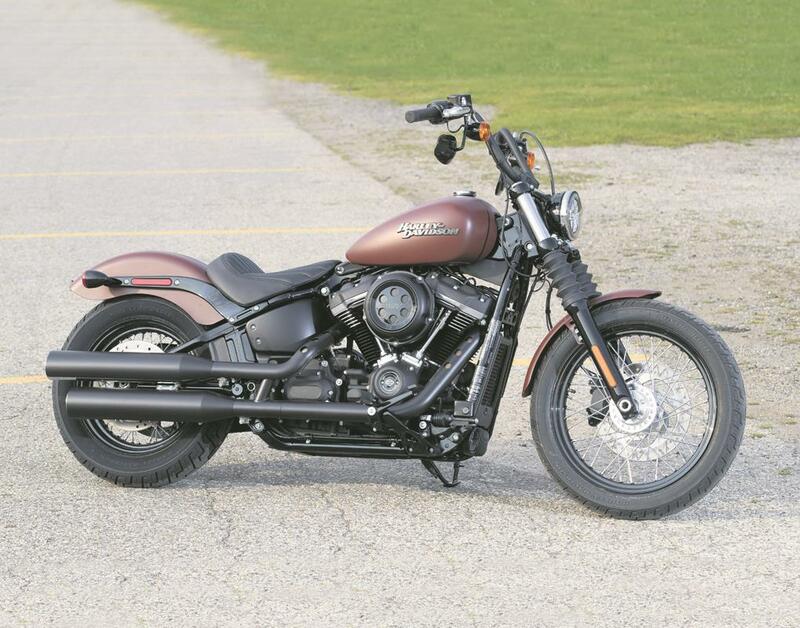 On the positive side, the Heritage Classic, of all the 2018 Softails, best delivers that elusive blend of style and practicality. It might not be as much of a crowd-stopper as the new Fat Boy, or as punchy as the Fat Bob, but the new Heritage goes and handles well, looks good and is impressively practical as well. Insurance group: 17 of 17 – compare motorcycle insurance quotes now. Engine and chassis apart, the biggest news with the new Heritage is a complete styling makeover. Where the old Heritage was a ‘50s-style chrome ‘n’ tassles cruiser complete with plexi-screen and studded panniers, the new goes for a more ‘40s, WWII, look where black replaces chrome and a military vibe takes the place of a Wurlitzer one. So, along with the new frame and uprated engine are a new screen, revised panniers, new LED headlights, stylish new clocks and more. OK, there’s still no electronics and little by way of luxury but it is a classy machine and Harley have noticeably raised their game. Front suspension Showa telescopic forks, no adjust. 3 owners have reviewed their HARLEY-DAVIDSON HERITAGE CLASSIC (2018-on) and rated it in a number of areas. Read what they have to say and what they like and dislike about the bike below. I fell in love with the bike on the test ride. It handled like a smaller, lighter bike but had smooth, confident power. I felt immediately comfortable. Dual front brakes would slow the power of the 114 more securely but the stock single is adequate. Ride is nimble and comfortable. The wind screen is too low for me leaving considerable head buffeting so upgrading to a taller screen soon. Incredible power, smooth and vibration-free, instantaneous acceleration in any gear. Build appeared flawless and solid. 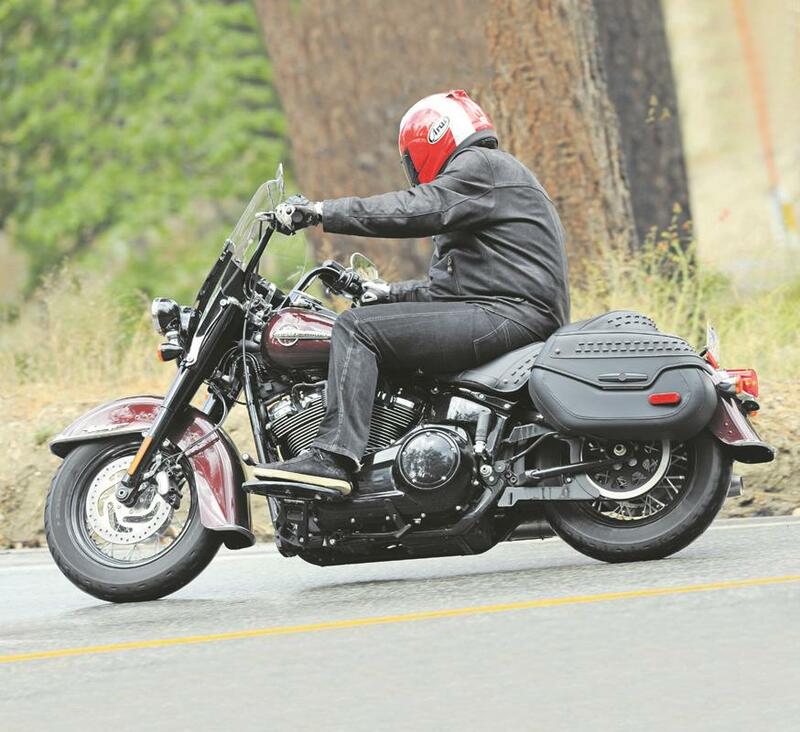 Hard bags are big improvement and the snap-on backrest and especially Tour-Pak make touring a real possibility. Bought from a dealer. Overall experience was just OK. The sales guy was uninterested in helping until he felt I was a sure buyer and then he rushed to do anything and everything but his interest felt hollow and insincere. Why buy a Road King, when the Heritage Classis does it all. Feels like modern bike, almost. The new Showa suspension soaks up the bumps and gives great confidence. The single disc up front is adequate but I find I use more rear brake than I'd usually use on a modern machine. The Milwaukee 8 is the smoothest engine Harley have made. 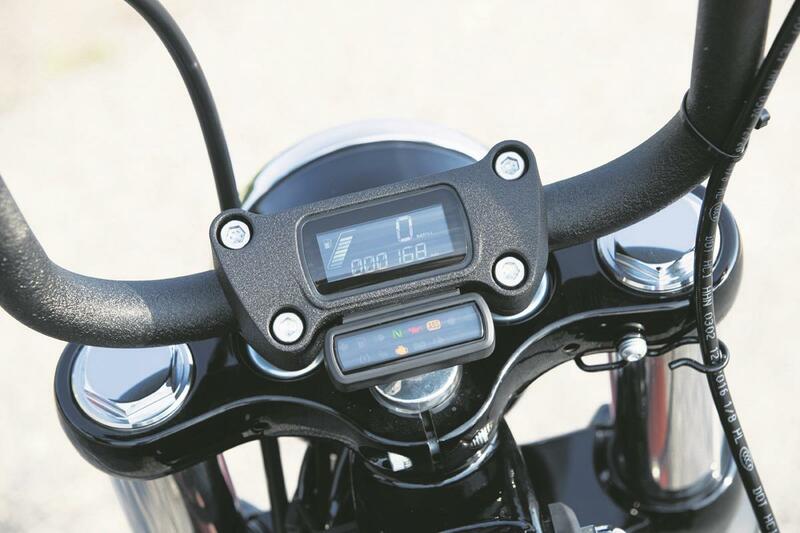 The 114 cubic inch version has torque enough to give acceleration in any gear. Quality has improved dramatically with the 2018 softail models. Only needs servicing every two years unless you rack up the miles. Screen, panniers and LED lights are all standard. Add a top box our Tour Pak as Harley call them and you've enough room for extended touring. Dealers are keen to offer demos and know their product range well. You'll struggle to get much off the ticket price on new models but great deals are available on accessories. This bike handles like a dream. The rider handles the bike not the bike handles the rider-very smooth. suspension is nice and balanced. The 107 has plenty of torque throughout the rpm's. The bags could be just a tad larger. The most enjoyable bike to ride i ever had. I can ride the bike several hundred miles, take a break and go again. This bike is at its best when you have country roads and then in town. Backrest and luggage rack would be o.k. My favorite features of the bike are color scheme-denim grey/denim black and handling. I bought from a hd dealer. the price was . $ 19,999 plus 9.5% sales tax. That was the advertised price. "Classic 50s styling and the latest version of their much loved, air cooled engine"
"Has clean, classic lines that are classic Harley"
"For some, the Road King is the best Harley of all"
"For the real Easy Rider/Chopper fans"
"For the custom fan who wants the authentic American experience"
"Mid-sized Sportster makes a lot of sense"
"Another Harley staple aimed at riders with traditional tastes"
"An evocative, all-American steed that can carry two plus luggage on a chugging adventure-cruise"
"The new for 2010 bike retains the old-school low-rider looks"
Classic looks aside - the Street Twin is a brilliant roadster in its own right. "Performs and handles better than any Harley before"
The heritage and imposing styling makes a Harley look almost meek when compared. "Another styling exercise to bolster what is arguably a tired range"